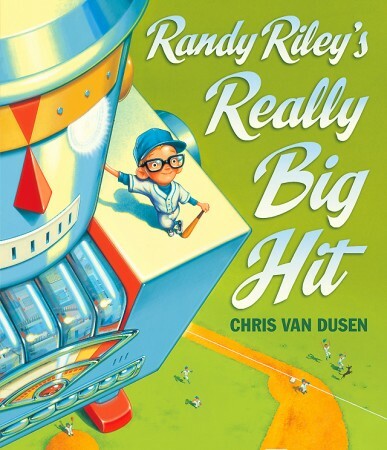 Fourth graders heard a new book this week, Randy Riley’s Really Big Hit, written and illustrated by Chris Van Duesen. And it was just that. A really big hit. I love finding new picture books that make perfect read alouds and this one more than fills the bill. The illustrations, with their retro look and bright colors, are so eye-catching and the large format of the book makes it an audience-pleaser. Randy Riley is a nerd who loves baseball and it the great tradition of the seemingly impossible hero, he ends up using his scientific skills to create a huge robot that saves the town from an approaching fireball by hitting it back into space. We used our visible thinking skills of plot prediction to come up with many ways that Randy could save the town. All in all, a great hit! Kindergarten–Another new book in our collection, My Snake Blake by Randy Seigel and illustrated by Serge Bloch is almost the opposite of Randy Riley’s Really Big Hit, but it was a great hit with the kindergarteners. Small, long, and narrow and with marvelous sketchy line drawings, it too made a great read aloud. Kindergarteners loved trying to figure out the words the snake can spell by twisting his body into incredible shapes. First Grade–A perfect book for using our visible thinking routine Fluttering Feelings is Leo Lionni’s Nicolas, Where Are You? First graders tracked the changes of the feelings of the mice as they moved from distrust to appreciation. As always with Lionni’s books, there is a wonderful subtle message of tolerance for differences and this title is no exception. Second Grade–missed Library this week due to early dismissal. Third Grade–This was a week for new books and another great new one is Jack and The Baked Beanstalk, written and illustrated by Colin Stimpson. A twist on the traditional tale, this book was a great opportunity for third graders to practice their thinking routine, Same, Same, Different. We had fun looking for the similarities and differences. The illustrations as fantastic and again, the size so great for a successful read aloud. A great addition to our library! Fifth Grade–After an introductory Keynote and doing the routine See, Think, Wonder, fifth graders heard an unusual story–Bag in the Wind by Ted Kooser. The story traces a plastic bag on a journey from a landfill to a little girl’s purchase in a second hand store. The illustrations by Barry Root perfectly complement the evocative, poetic text. This is a picture book that is clearly for older readers and one they might pass by on their own, but it is well worth reading and stimulated a great discussion about the need for recycling. Sixth Grade–no library this week.